so small also the number of especially today’s connoisseurs , the connoisseurs with the particular eye , with the need to experience these wonders of velvety now blackness , now brownness not only optically , no , preferably even feel it with most delicate fingers , to make sure not to dream . The father had complete command of this technique , too , but his youngest was its master . And the otherwise so meritorious elder brother , here he had to pass , indeed never tried it . Voilà , so it was about time to heal greatest neglect and remember the youngest tenderly as he remembered the father . Th. Mann resumes right at the beginning of his Joseph Trilogy . 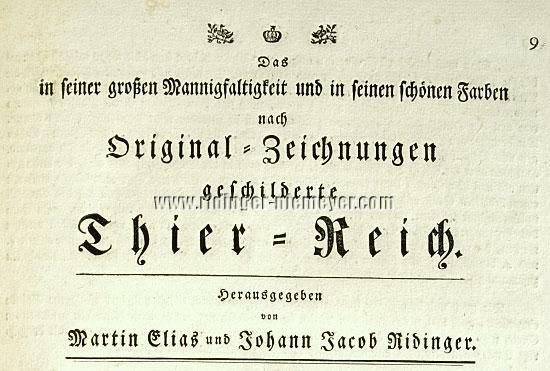 Of conditional kind then only, too, the chronology of the Ridingers mutually belonging to Ulm and Augsburg, in sixth generation experiencing their zenith with Johann Elias (1698-1767). However, in sixth only because beyond the tangible patriarch Bartholomäus († 1591) the depth of the “Fountain of the Past” (Th. M.) imposing on the curious a to here and not further. But as far, as rich, as unfathomable the roots of a trunk may be, the axe of time usually is less. Johann Elias as sixth of the series had eight children with Jacobina née Zur Helle (1694-1773), the widow of his boyhood friend and guildsman Johannes Seuter, of which three survived infancy/childhood. And the marriage of daughter Regina (1732-1774) remained childless. Just as the surviving eldest of the boys, Martin Elias (1731-1780; after Elias Jacob & Daniel Bartholomew) was married only with the art, with his father’s example and work. And left it to the brotherly co-seventh generation, Johann Jacob (before finally yet Johann Adam), to top the Ridinger genealogical tree by Rosina Barbara (1776-1846) as now eighth generation. From 1805 strictly Augsburg married with Gottlieb Ludwig Harwen (1774-1812), with whom she had five children, of which three were allowed to grow up. And apropos the latter for honesty aforesaid youngest one of the eight Ridinger children, indeed Johann Adam, should be remembered commemoratively 273 years later as probably having been the brightest of all eight. For he stood it the shortest and betook himself after just well about two months. Just as then Lessing respected the reason of his one to call it a day after just twentyfour hours. But that indeed is wandering too far. At the age of 40 he marries in Augsburg Rosina Morgenstern (1743-1781), entered in the church register as “‘outside copulation’ without place”, nonetheless having been baptized at St. Ulrich. From this marriage aforesaid Rosina Barbara came. In childless second marriage the widower married in Riedlingen 1782 Sophia Juliana Rosina Ammerbacher (1748-1827) from Langenburg in Hohenlohe, whose second marriage entered 1785 as widow with the Augsburg “tradesman and art publisher” Johann Friedrich Wilhelm established at least no immediate relation to the Wilhelms, who 1821 the latest took over as successors to Engelbrecht “Ridinger’s and Haid’s art shops”. The whole plenitude of genealogical facts from Monika Michel , (Predecessors and Relatives of the Animal Painter and Engraver Johann Elias Ridinger), in Blätter des Bayerischen Landesvereins für Familienkunde, vol. XV (1987), pages 396-414. (Joachim von Sandrart, Teutsche Academie I,  3 [Painting], pp. 101 f.). 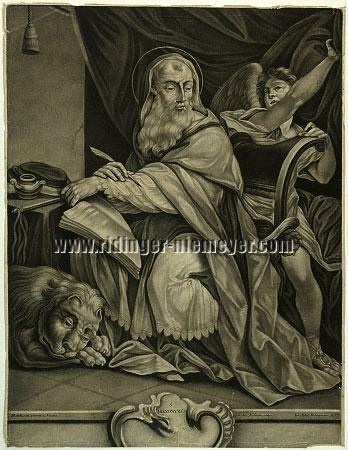 “ The peculiarity of the method is easily explained: While hitherto intaglio prints, for instance the engraving or the etching, were created by drawing and hatching with a sharp tool on a copper printing plate, either smooth or prepared with a coating, the mezzotint method turned everything hitherto into the contrary. The idea is that of an evenly roughened copper printing plate as starting point. 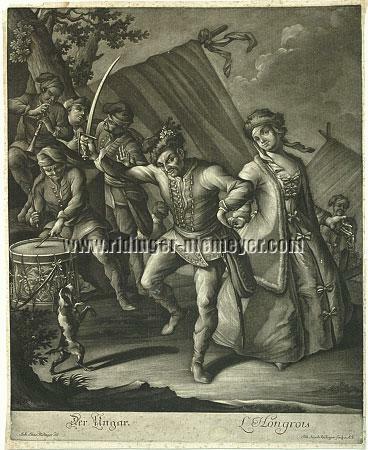 The soldier and artist Ludwig von Siegen invented in 1642 the screen for image representation and at the same time the first printing technique by which half-tones could be produced. The result astonished art theory and enthused collectors. A picture without drawing was hardly imaginable since the beginnings of theoretical study in 15th century Italy. Since Alberti’s treatise on painting the drawing had an unchallenged consequence for the composition of pictures and in the 16th century theorists like Giorgio Vasari and Paolo Lomazzo even challenged the quality of a painting which seemingly acted without the means of the drawing. Compared with this the results of some mezzotints yet showed effects which could not be attained with hitherto printed graphics. Ludwig von Siegen’s invention showed that a new way in graphics off the traditional rules of pictorial design could lead to remarkable results. It seems paradoxical that this happened at a time of great successes of academicism in art theory, the strict conceptions of which this invention belied after all. In the 17th century art academies were founded in many European cities, taking over an important part in the education of artists, the general taste, and the bias of artistic programs. (Frithjof Schwartz, [At the Beginning was the Screen], in Frankfurter Rundschau, Nov. 16, 2009). Johann Elias Ridinger. Half-length self-portrait from front. 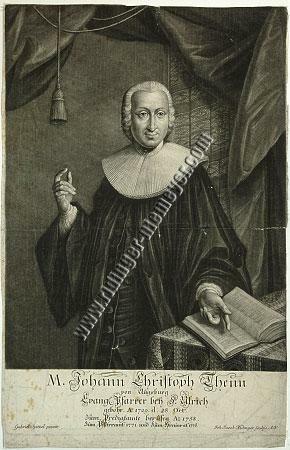 Mezzotint by Johann Jacob Ridinger. Inscribed: Jean Elie Ridinger inv. et del. / Dedié à Monsieur Jean Elie Ridinger Peintre et Graveur et Directeur de l’Académie d’Augsbourg. Gravè par son tres humble et obéissant fils Jean Jaq. Ridinger. An. 1767. 15⅜ × 10½ in (39.2 × 26.6 cm). Thienemann XXI, 3; Schwarz 5; Coppenrath Collection II (1889), 1448; Helbing XXXIV (1900), 4; Schwerdt III (1928), 133; Rosenthal 126 (1940), 444; Ridinger Catalog Darmstadt (1999) I.3 with ill.; Siebert-Weitz, Ridinger (1999), ill. 1; Niemeyer, (The Vanitas Symbolism with Joh. El. R.) in L’Art Macabre 2 (2001), 94 ff. refining the drawn predecessor from 1741 – Schwarz I, XIX & II, plate I – showing the far younger in similar ambience also at the lamp, but without the framing by the window, vanitas-cozy globe and before all without the heavy curtain, since the Middle Ages a representative of the secret and mystery and repeatedly consciously used by Ridinger since the title sheet for the riding school of 1722.
whenever notable previous owners could be named. were considered quality seals increasing the value. they seemed to raise the quality of paintings. his own flair of quality and made a name for himself. Max Speck undoubtedly was conscious of this. After his father’s design. Inscribed: Joh. Elias Ridinger del. / Joh. Jacob Ridinger sculps. A.V., otherwise as above. 20¼ × 16⅝ in (51.4 × 42.1 cm). – Schwarz (1910) 1475 & II, plate XXXIV; Counts Faber-Castell (1958) 165; Wend, Ergänzungen zu den Œuvreverzeichnissen der Druckgrafik, I/1 (1975), 107. Not in Thienemann (1856) & Stillfried (1876) , Weigel, Art Stock Catalog, pts. I-XXVIII (1838/57) , Silesian Ridinger collection at Boerner XXXIX (1885) , Coppenrath Collection (1889 f.) , Reich auf Biehla (1894) , Helbing XXXIV (Arbeiten von J. E. und M. E. Ridinger; 1900) , Rosenthal, Ridinger list 126 (1940). About equal-sized repetition in reverse of Th. 1236 (missing with Baron Gutmann/Schwarz), belonging to the 4-sheet set of conversation pieces as Thienemann’s 3rd group “Genre Pictures of Mixed Kind” relinquishing the German-Latin caption (“The Merry Hungarian dances to Drum and Shawm … ”). – With supposedly WANGEN watermark as standing for contemporary impressions. – Of saturated print quality with fine chiaroscuro. After his father’s design. Inscribed: Ioh. Iacob Ridinger sculps. / Ioh. El. Ridinger del. A. V., otherwise as above. 19⅞ × 14½ in (50.5 × 36.9 cm). Thienemann & Schwarz 1270 (cf. Schwarz II, pl. XLI as “Variant”, recte first state, 1488); Silesian Ridinger collection at Boerner XXXIX, 1998 ( “Very rare”, 1885 ! ); Reich auf Biehla 245 (“Rare”,1894); Counts Faber-Castell (1958) 108. – Boerner & Biehla without state detail. Not in Weigel, Art Stock Catalog I-XXVIII (1838/57; there only per 18,543 a Pastor bonus in octavo) , Coppenrath Collection (1889 f.) , Hamminger Collection (1895) , Helbing XXXIV (Arbeiten von J. E. und M. E. Ridinger; 1900), Rosenthal, Ridinger list 126 (1940) . in a marvelous copy of vibrant chiaroscuro. With otherwise minimal deviations distinguishable by the stylistically refined cartouche in the lower, otherwise empty, text field, as routine faux pas expressly regarded by Schwarz as Baroque cartouche as with its mussel decoration and the curved lateral guidance with ornamental foot actually correct for 1488 only. Present one, however, with exception of the lateral, though likewise simplified vine-leafs stripped of any decoration and also laterally closed plain-austerely. In the lower margin of it the upper delineation of the lower of the two previous mussels still tenderly visible. With WANGEN watermark as standing for old impressions and with margins of 3-5.5 cm on all sides with partially still slight plate dirt in the lateral and lower platemark. The utterly smoothed out former centerfold not perceptible from front. Acid-freely backed small tear in the white right lateral margin. Correspondingly rare then, too, both present Th./Schwarz 1270 as also Schwarz 1488, of the latter a copy is traced here in the trade of the 80s. As “Rare” already 1850 Weigel lists per 18543 a Pastor bonus in full figure (together with St. John Baptist & St. Joseph), but as octavo not identical with the present one. If that refers to the compositionally entirely different Th./Schwarz 1322 – Christ enthroned on clouds, the right foot on the skull of the dragon – must be left undecided as both do not give the format. et hæc dicens expiravit. Luc. 23. After his father’s design. Inscribed: I. N. R. I. at the head of the cross / Ioh. Iacob Ridinger sculps. / I. El. Ridinger excud. Aug. Vind., otherwise as above. 24⅞ × 17¾ in (63.3 × 45.1 cm). Schwarz 1492 with ills. II, plate XLII; Wend, Ergänzungen zu den Œuvreverzeichnissen der Druckgrafik, I/1 (1975), 155 (variant in writing); Faber-Castell 167. Not in Thienemann (1856) , Stillfried (1876) , Weigel, Art Stock Catalog, division I-XXVIII (1838/57; more than 1000 R. sheets of the etched/engraved work) , Silesian Ridinger Collection at Boerner (1885; “of greatest richness … many rarities”) , Coppenrath Collection (1889/90) , Reich auf Biehla Collection (1894; “Of all [R. collections on the market] since long time there is none standing comparison even approximately with the present one in respect of completeness and quality … especially the rarities and undescribed sheets present in great number” , Gg. Hamminger (1895) , Helbing XXXIV (Arbeiten von J. E. und M. E. Ridinger, 1554 items, 1900) , Rosenthal, Ridinger list 126 (1940). Fine black impression determined by contrast-rich chiaroscuro – marvelous the play of the incidental light from above – with typographic watermark (WANGEN?) with margins running around 1.5-2 cm wide, fox-spotted on three sides, though generally little perceptibly slightly spotted, and doubled. The previously smoothed out centerfold still slightly visible. From the sequence of the nine crucifixions, besides the present one provable here only in the copy Schwarz (von Gutmann Collection, 1910, acquired by this, however, already 1903 not with the Horn Collection) as well as a variant traded here in the 90s. in an oasis, pointing with the left at the invisible Jesus. After his father’s design. Inscribed: Ioh. Iacob Ridinger sculps. / Ioh. El. Ridinger del. A.V., otherwise within a baroque cartouche as above. 19¾ × 14⅜ in (50.3 × 36.6 cm). – Thienemann & Schwarz 1269; Silesian Ridinger collection at Boerner XXXIX, 1997 ( “Very rare”, 1885 ! ); Counts Faber-Castell (1958) 107. Not in Weigel, Art Stock Catalog I-XXVIII (1838/57) , Coppenrath Collection (1889 f.) , Reich auf Biehla (1894) , Helbing XXXIV (Arbeiten von J. E. und M. E. Ridinger; 1900) , Rosenthal, Ridinger list 126 (1940). With margins 2-2.5 cm wide throughout. – Throughout creased and with large corner tear off upper left with slight touching of the subject margin free of any depiction. The impression itself of fine chiaroscuro. S. Franciscus Seraphicus. With crucified seraph beside boulder overgrown with grass on top as attribute of the wilderness “as the effective ideal for saints doing penance” (Nicole Hartje). The right of the folded hands with stigma. After his father’s design. Inscribed: Ioh. Iac. Ridinger sculps. / Ioh. El. Ridinger exc. Aug. Vind. / S. | FRANCISCUS | SERAPHICUS. (in the upper loop of the otherwise empty mussel-shaped cartouche in the broad lower edge). 21½ × 16¾ in (54.6 × 42.5 cm). Compare Thienemann 1288 (only c. 20¾ × 15⅜ in [52.6 × 39.1 cm]; without the engraver’s signature of Johann Jacob and only “A. V.” instead of “Aug. Vind.”; not mentioned book inscription & rock staffage; cf. Schwarz 1543, however not identical with Schwarz 1288 just for the format) – Schwarz 1288 (? 24⅜ × 19½ in [61.8 × 49.5 cm]; without the book inscription, but with the boulder background; shortened signature as Th. 1288, its identity provisionally questioned by Schwarz) – Schwarz 1543 (22¼ × 16¼ in (56.4 × 41.2 cm]; with book inscription, but without the boulder, shortened signature as before, but “excud.” instead of only “exc.”). Reich auf Biehla 250 ( “Extremely rare”, 1894 ! Without state detail & “Somewhat damaged.” ); Faber-Castell 115 (negligently as version Schwarz 1288). – As erroneously taking Th. & Schwarz 1288 for identical not in Wend, Ergänzungen zu den Œuvreverzeichnissen der Druckgrafik, I/1 (1975). Not in Weigel, Art Stock Catalog, pts. I-XXVIII (1838/57), Silesian Ridinger collection at Boerner XXXIX (1885); collections Coppenrath (1889 f.) & Hamminger (1895), Helbing XXXIV (Arbeiten von J. E. und M. E. Ridinger, 1900) & Rosenthal, Ridinger list 126 (1940). According to current knowledge Ridinger dedicated eight versions or variants resp. to the saint, five of which in close following to the 1288 sujet (besides those already discussed including the present one the reduced copy of Schwarz 1288 per Stillfried/Schwarz 1423, 13½ × 9⅜ in [34.4 × 23.7 cm]), two generally connected with the theme (1339, 13⅜ × 9 in [34.1 × 22.9 cm] & Schwarz 1544, 25¼ × 17⅞ in [64 × 45.3 cm]), and Schwarz 1542 as completely independent (19⅝ × 14¾ in [49.9 × 37.6 cm]). additionally with Johann Jacob’s signature as engraver . Common to all by the way their virtually entire missing on the market. Of those known to literature only Th. 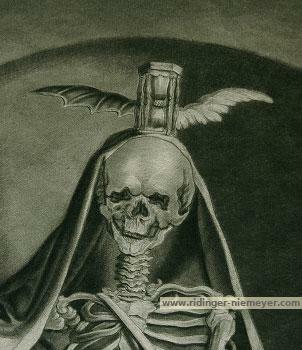 1339 occurred in the well-equipped mezzotint section of Rosenthal’s Ridinger offer from 1940 (no. 420) & 1958 at Faber-Castell (123). Ridinger’s remarkable interest in Francis of Assisi doubtlessly not least stimulated by a “He preached to the animals”. Here then present in very fine, highly nuanced impression. And the intellectual content of the physical message reflected by the chiaroscuro. With WANGEN watermark along with secondary sub-mark as standing for contemporary impressions. The surrounding margin unevenly trimmed between the short extreme of 1 mm and 15 mm with mostly 10-15 mm on three sides. Two longer and three short traces of tears, each only minute, professionally restored and therefore without noticeably impairing of the also with respect to preservation very fine general impression. Backed besides three tiny tears in the white margin. After Gabriel Spitzel (also Spizel, 1697 Augsburg 1760). Inscribed: Gabriel Spitzel pinxit. / Joh. Jacob Ridinger sculps. A.V., otherwise in German as above & following. 15⅞ × 10½-10⅝ in (40.3 × 26.7-26.9 cm). Thienemann-Stillfried (1876) & Schwarz (1910) 1436, both first state only; Hamminger Collection 1887 ( “Very rare Sheet”, 1895; without remark to the state ); Counts Faber-Castell (1958) 148. Not in Th. himself (1856) , Weigel, Art Stock Catalog, pts. I-XXVIII (1838/57) , Silesian Ridinger collection at Boerner XXXIX (1885) , Coppenrath Collection (1889 f.) , Reich auf Biehla (1894) , Helbing XXXIV (Arbeiten von J. E. und M. E. Ridinger; 1900) , Rosenthal, Ridinger list 126 (1940). “To the vicarage 1771 and to the senior councilor 1776.”. 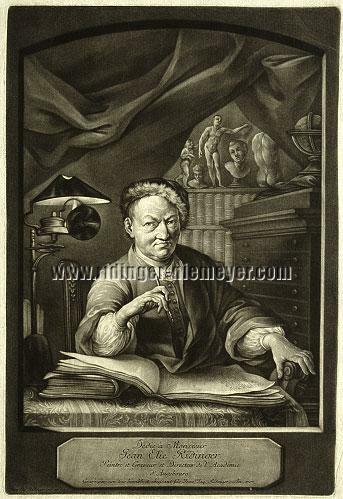 Spitzel, on friendly terms with Johann Jacob’s father Johann Elias Ridinger for whom he arranged the important early stays at Count/Baron von Metternich in Regensburg, was himself also mezzotint artist and publisher, yet closed the publishing house in 1739 in favor of mobility (i. a. Gera, Halle, Köthen, Berlin, since 1756 in Augsburg again). Thieme-Becker XXXI (1937), 391 f. mention among his portrait paintings of protestant parsons only those of Rentz & Schleißner, the latter at the Church of the Holy Cross in Augsburg. an early example of Protestant-Catholic ecumenicity . Many Lynxes are the Deer’s Death. Edged pen and ink drawing with wash in black (outline) and grey-brown on chamois-colored strong vélin. 12¾ × 19⅜ in (323 × 493 mm). 139. A rocky landscape where a high-reared stag to whose back a lynx is clinging, is surrounded by three lynxes. With the name. 1746. Pen. large obl(ong). f(ol). 163. A rock part with a big oak, where a high-leaping stag with a lynx on the back tries to escape two lynxes lurking for him. Another lynx looks down from the oak. With the name. 1747. Wash and black chalk. large. fol. (17 × 15 in [433 × 382 mm].) – See Th. (orig. ed.) plate 12. 165. Rocks with trees, where twelve stags and hinds try to save themselves from five lynxes by jumping down into water. One of the stags is seized by two lynxes. With the name. 1745. Wash. large obl(ong). roy(al). fol. Cf. Weigel 214: A closed rock part, in the foreground water, where from the rock on the left stags and hinds throw themselves down to escape from the wolves; on the right a wolf pursues two hinds. With the name. 1745. Black chalk. Counterproof. obl. roy. fol. Without reference to counterproof 1892 at Wawra, Auction Sale Catalog of a Fine Collection of Drawings and Prints by Joh. El. Ridinger from the Estate of a Well-known Collector, no. 82. 167. 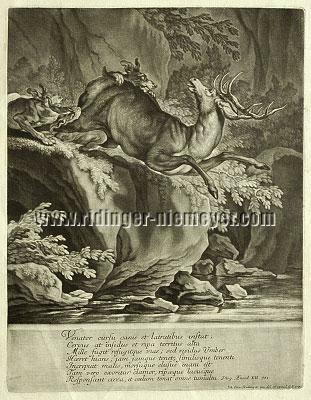 A rock part; ten stags and hinds, attacked by four lynxes, save themselves by taking flight; one stag in the water is seized by a lynx, another one fights on a boulder with two lynxes. With the name. 1745. Black chalk and wash. large obl. fol. 170. A forest with ravine; a setting stag attacked by three lynxes, of which one clings to him. Bister. roy. fol. 192. A stag to which two lynxes cling and hold him, another lynx comes out of the wood, the hind flies. Pen outline, the trees sketched in black chalk. obl. fol. 219. A rocky landscape with water, in the foreground on a rock two stags, the one standing on his hind legs which is seized by two lynxes; another, with one lynx on the back, makes a leap down into the water. Five hinds flee from the rock as above left a lynx is following them. With the name. 1745. Wash, top rounded. obl. fol. – To Th./Schwarz 1144 as the following. 1921. “The Stags attacked by Lynxes on the Rutting Spot.” Black chalk with wash. Inscribed. obl. fol. To Th. 1144 (as already the above). Fine main sheet. Below water, surrounded rocks, on these a royal rearing up, whom a lynx bites through the jugulars, another one, which clings at his belly, he kicks that it cries out loud. A strong six-pointer makes a stupendous leap into the water to get rid of the berserk sitting on him. Four piece of deer, a brocket at the head, hasten for the water. 1922. Similar representation, with the same inscription. Ditto, ditto. Inscribed. large obl. fol. Equally important sheet. 1926. A stag is pursued in rock scenery by three lynxes. Pencil and sepia (should actually be bister). large fol. Very fine sheet. Obviously all of more or less equally large mostly oblong size , with 1745-47 the dates reveal for their creation a thematically as chronologically tight scope of three years the most. Which raises the question what lynxed the master then that much, whether he pursued a particular, yet, as documented here already by means of drawings for the mating call, not realized independent lynx-stag project. Mostly signed, they refer to Johann Elias himself. What precludes studies by the growing up eldest, Martin Elias, by means of his father’s set pieces since at least present work consists of such throughout. To what extent the works from the mid-40s in this regard actually represent new groups and by this a mine for future works – as for instance for the drawing to aforesaid lynx-ibex composition of Th. 363 according to Schwarz to be set with 1752/53 – requires further research. As regarding the mid-40s, being on vélin (without lines) for present work the father’s hand is out of the question. Invented in England about 1750, productionwise this came to the continent (France) only 1779 and 1783 to Germany. 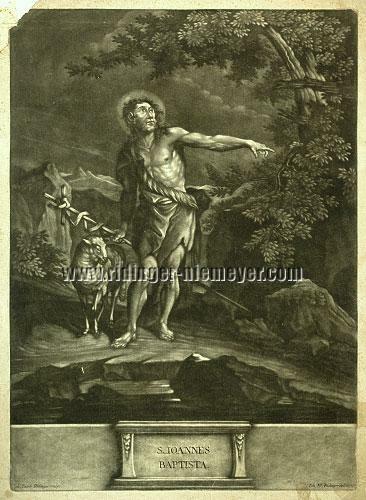 In analogy to the Dutch papers favored by Johann Elias according to his own testimony for the colored works, for the late period the use of vélin outside of the hitherto proven graphical works irrespective of its local production generally to be precluded all the less as already Johann Elias in his mid-20s had established himself by a Stag Hunt (Schwerdt III, plate 214; erlebnis ridinger, p. 5; each in color) as according to Wend the “supposedly earliest German mezzotint in colors” as one also technical forerunner. Anyway, recently a wooded landscape (pen in black, with brush in black, grey wash, 10½ × 15¾ in [268 × 400 mm]) associated with Ridinger’s youngest, Johann Jacob, with vélin as material showed up in German trade, which corresponds with the four folio-sized signed drawings (Jacob Ridinger del.) 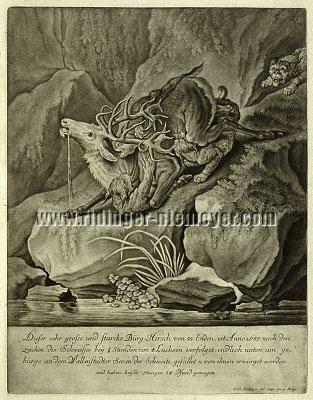 of 1773/74 of the collections Marschall von Bieberstein (Catalog of Drawings, Prestel 1879, 110: Forest regions with deer and wild boars, chalk) and Silesian Ridinger collection dissolved 1885 (Boerner XXXIX, 2079: Fine wooded landscapes with deer, wild boars etc., Excellently executed pencil drawings. Mounted) resp. and quotes sheet 15, Th. 210, of the Brockes set, yet at the same time signals insider familiarity by omitting alienation of the three boars (sic!). Were there not Th. 1144 with especially the significant specific of the royal rearing up with the one lynx by the neck and the other at the belly, see above. And if the transfer of the father’s design into the copper were not exactly by … Johann Jacob! By which his occupation with that curious group from the mid-40s becomes obvious. Should the creation of the print fall into the time after the father’s decease, at which Johann Jacob was 31, it would fall into the period of general working off of the paternal bequest by the sons. As not least the lynx-ibex variant called on above from the set of the Incidents concluded only 1779. While these considerations on the origin of present drawing inevitably are not peremptory, so according to current knowledge nevertheless plausible. And more conceivable than that one of the various Ridinger copyists of the first half of the 19th century should have practiced of all things with a lynx-deer theme unused to the overview here. A Ridingerianum with questions . Indeed . Yet not without answers . Pointing to the opinion here to Johann Jacob the more the sheet is beheld , the more the facts are weighted. 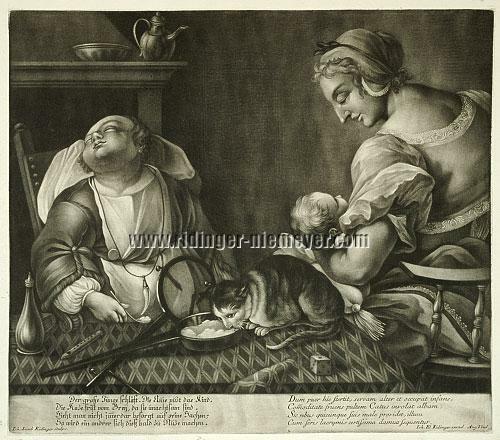 On the left the boy fallen asleep over his food on the inclined table with the cat lapping up his mush, while the nurse cares for the baby on the right. Also in sloping position the coffee-pot on the shelf. Tome, flute & die as additional vanities. After his father’s design. Inscribed: Ioh. Iacob Ridinger sculps. / Ioh. El. Ridinger excud. Aug. Vind., otherwise as below. 15¾ × 17⅞ in (40 × 45.3 cm). – Not provenance Faber-Castell/Castell-Rüdenhausen. Schwarz 1473 & plate II, XXXII; Mörgeli & Wunderlich, Über dem Grabe geboren – Kindsnöte in Medizin und Kunst (to the exhibition in the Medical-Historical Museum of the Zurich University), 2002, within (Baby Feeding), p. 196 with ill. – Not in Thienemann (1856) & Stillfried (1876) and with the exception of Baron Gutmann (Schwarz, 1910) & Counts Faber-Castell (1958) here not proven elsewhere. The big boy sleeps. The nurse cleans the child. The cat eats the mush as they are careless. So someone else will take advantage of this soon. which shows the “minimized Ridinger” (Niemeyer) as a master of vanity, too. S. Ambrose. On the left angel with crosier & tiara. After Alessandro Marchesini (1664 Verona 1738, active in Verona, Venice, Padua). Inscribed: Marchesin pinxit a Venetia. / Ioh. Iacob Ridinger sc. / Ioh. El. Ridinger exc. A. V., otherwise in the upper cavity of the mussel-shaped cartouche S. | AMBROSIUS. 21 in (53.2 cm) sheet height × 16¼ in (41.3 cm) width platemark. Schwarz 1532; Faber-Castell 171; Wend, Ergänzungen zu den Œuvreverzeichnissen der Druckgrafik, I/1 (1975), 206. Not in Thienemann (1856) , Stillfried (1876) , Weigel, Art Stock Catalog, pts. I-XXVIII (1838/57) , Silesian Ridinger collection at Boerner XXXIX (1885) , Coppenrath Collection (1889 f.) , Reich auf Biehla (1894) , Gg. Hamminger (1895) , Helbing XXXIV (Arbeiten von J. E. und M. E. Ridinger; 1900) , Rosenthal, Ridinger list 126 (1940). in very fine impression of rich contrast with watermark WANGEN as standing for contemporary impressions, below, however, and parallel to the Hieronymus sheet, trimmed under loss of 3.8 cm within the inscription field with mussel-shaped cartouche reserved for entries of individual kind, though usually left empty in the preserved copies and here therefore obviously deemed dispensable for the picture, otherwise fine margin of 2-3 mm running around on three sides. In the subject itself – numbered in its right upper corner with red chalk pen “75” – some folds & little pleats. Some few marginal tears, the longest of which reaching 4 cm into the filling of the picture. Of the slight foxing spots on the back isolated ones showing through to the subject. Irrespective of this of definitely pleasing general impression, not least with respect to the rarity of these sheets as then already 1839 those by Ridinger after Marchesini remained unknown to Nagler (VIII, 304). descending from one “of the oldest noble families of Rome”. 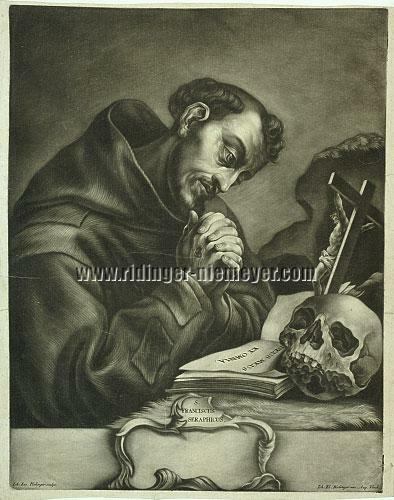 S. Jerome. Looking laterally to the ground to receive his inspiration by the angel standing behind his seat. This just came forth from the heavy curtain – standing for the curtain of life, since the middle-ages then also symbol of the mysterious – still held back by the raised left. On the little table beside cardinal hat & inkstand scourge as instrument of torture of Christ’s. Left at his feet the front of the peacefully resting lion. After Alessandro Marchesini as before. Inscribed: Marchesini pinxit a Venetia. / Ioh. Iac. Ridinger sculps. / Ioh. Elias Ridinger exc. A. V., otherwise in the upper cavity of the mussel-shaped cartouche S. | HIERONYMUS. Subject size 21⅞ × 16¾ in (55.7 × 42.5 cm). Schwarz 1548 (variant in writing: “Iacob” & “I. El. … excud.”); Faber-Castell 176 (without mentioning of the variant as against Schwarz); Wend, Ergänzungen zu den Œuvreverzeichnissen der Druckgrafik, I/1 (1975), 229 (variant in writing: “Iac.” as here, otherwise as Schwarz). Not in Thienemann (1856) & Stillfried (1876) , Weigel, Art Stock Catalog, pts. I-XXVIII (1838/57) , Silesian R. coll. at Boerner XXXIX (1885) , collections Coppenrath (1889 f.) , Reich auf Biehla (1894) & Hamminger (1895) , Helbing XXXIV (Arbeiten von J. E. und M. E. Ridinger; 1900) & Rosenthal, Ridinger list 126 (1940). 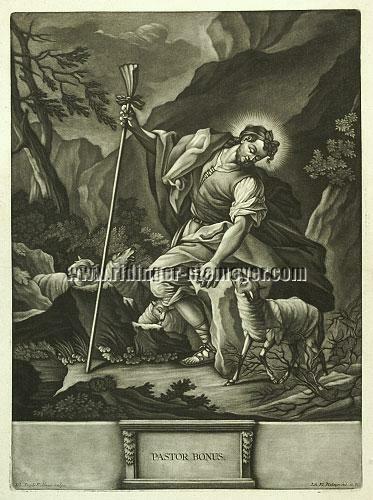 Jerome (Stridon/Sdrin, Croatia, about 340/42 – Bethlehem 420 [419? ]), after a youthful past likewise risen to the most prominent doctors of the church in very fine impression of rich contrast with variant in writing, otherwise with WANGEN watermark as before. Below in line with above pendant of Ambrose trimmed under loss of 2 cm within the mussel-shaped cartouche. The otherwise tiny(est) margin running around on three sides partly cracky on two sides, here and there up to the edge of the subject. In the subject itself – numbered in its right upper corner with red chalk pen “80.” – some folds & little pleats, under passepartout at the latest of definitely pleasing general impression, not least with respect to the rarity of these sheets as then already 1839 those by Ridinger after Marchesini remained unknown to Nagler (VIII, 304). as circular chain dance of nine women plus skeletons around opened casket with two skeletons within and without the churchyard wall as centerpiece. In addition to it, placed back, chapel & charnel-house (?) along with walls. In the corners the Fall of Man – Calvary – Eternal life & Purgatory , in-between two text-cartouches. In the outer field surrounded by 12 medallions together with text-cartouches for the dance of the men, separated by 8 (6 varying) vanitas attributes. After his father’s design. Inscribed: Ioh. Iacob Ridinger sculps. / Ioh. El. Ridinger excud. Aug. Vindel., otherwise as following. 25¾ × 18⅞ in (65.3 × 48 cm). Thienemann-Stillfried & Schwarz 1428; Silesian Ridinger collection at Boerner XXXIX, 2032 ( “Extremely rare”, 1885 ! ). not fixable in their states based on their descriptions. However, the one presented by Patrick Pollefeys on the internet proves to be the earlier, currently suppoesedly first state. Not in Thienemann and in Dresden, see below, missing in the ample stocks of Weigel (1857) , Coppenrath (1889/90) , Wawra (1890) , Reich auf Biehla Collection (1894; “Of all [R. collections on the market] since long time there is none standing comparison even approximately with the present one in respect of completeness and quality … especially the rarities and undescribed sheets present in great number”; 1266 sheet plus 470 duplicates & 20 drawings) , Hamminger (1895) , Helbing (1900) , Rosenthal (1940) , and others more. not only on the market, as documented above, but generally. According to Thienemann missing also in Dresden, see at the beginning, and indeed made known by Count Stillfried in 1876 only, yet whose quotations not entirely accurate. 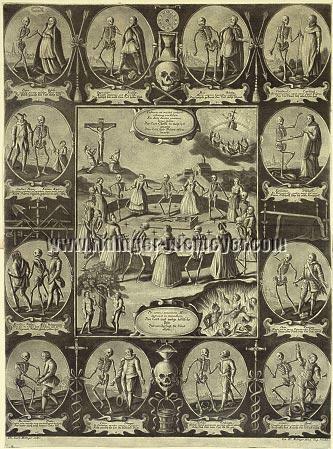 in updated repetition of an anonymous broadsheet of the late 16th or early 17th century, in any case “before 1623” as the “demonstrably earliest and best known Dance Macabre illustration of this kind in the German-language area” (that in this connection in respect of “demonstrable” indeed, nevertheless surely erroneously, is thought only of the succession of that anonymous from the side of the Nuremberg publisher Paulus Fürst is referred to below), namely “that special kind of the dance macabre in which both manners of representation – the dance in circular form and the dance in procession in pairs of the living and the personified dead as the both most important among the dances macabre – are combined” and therewith forms the “one and only figure being able to represent the dance macabre ‘completely’ … at which the chapel with wall on the horizon (whose complex Ridinger has enlarged here by the said second building with its own wall) … is faded in as a third perspective … this all taken from the familiar linear form of the dances macabre printed in books (following the representation on churchyard walls as the origin) … but nevertheless arranged in circular form” (see Imke Lüders, Totenreigen-Totentanz, Totentanzillustrationen auf Flugblättern des Barock und ihre Rezeption, in L’Art Macabre 1, Dusseldorf 2000, along with illustrations, on these see below). The texts of the cartouches each time in Latin & German versions. – In the centerpiece between Calvary & Eternal life “Christ’s death has ruined death and returned life ” & below between Fall of Man & Purgatory “Death and eternal hellish pain has brought about the sin alone”. The outer field presents clockwise from 1-12 the stations of the social structure of the great hundrum of the end, in the course of which the status symbols lie disrespectfully on the earth. Only the fool has been left cap and bells and the right grips the wand. As the essential links should be mentioned above/below middle, each time one beneath the other, timer (12 o’clock 25), hour-glass, death’s head, bones and death’s head with cup/funnel (?) sitting on, bucket with whisk filled with liquid. Left/right middle crossed gravedigger’s tool kit between bier & casket with pall flanked by four chandeliers. For surely this Wolff heirs “version” is the original one mistaken for lost. In the course of which Imke Lüders only overlooked the use of the publishers to engrave in old plates of others, exchanging if necessary, the own address. With the result that the Wolff dates could irritate her. 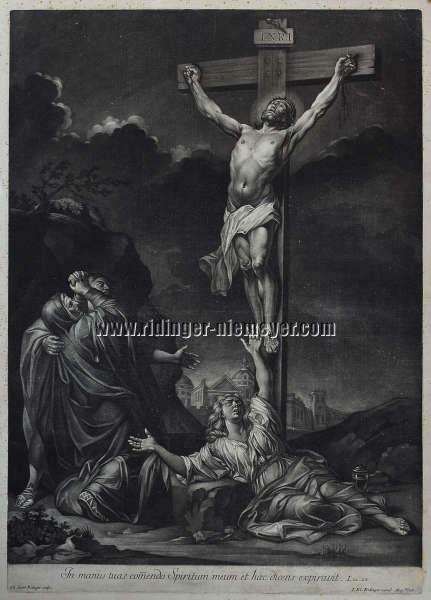 This shows not at least a comparison with the replica contrastly illustrated by her of the “so-called monogramist ‘J.W.’” – surely the Augsburg art publisher & engraver Jeremias Wolf(f), 1663-1724, to whom Ridinger stood in work contact during his early period – “of the late 17th century” after the engraving published by Fürst (ca. 1605 – 1666) introduced already above, with which this on his part followed to the early original which later has been “copied” by Wolff heirs, too. This replica of the Fürst version by the monogramist worked before that published by Wolff heirs is more modern than the following latter, consequently the origin of that has to be sought in earlier time. The complications following from this reflection, namely especially from the fact that in the Fürst version still lacks the high important attributes of churchyard wall, casket & chapel in the center-field, may be in silence here as less interesting for the Ridinger mezzotint. Of consequence however that Ridinger was acquainted with both the Wolff heirs “replica” of the original version of that novel dance macabre representation and the monogramist’s replica after Fürst, which latter he follows textually predominantly, too. So for instance in the upper text cartouche with “… zu nicht hat gemacht Den Todt, und SLeben widerbracht” & in the duke’s medallion “… dem Tod (with ‘J.W.’ Todt) zletz wirst”, whereas with Wolff Heirs it is “… hat gemacht, den Tod u. das Leben …” & “… Dem Tod zuletz wirst”. For beyond Ridinger’s already mentioned period adjustment of the figures as not without common practice his version differs at least in present 2nd state also elsewhere from both those models. Not only that he shows the inconspicuous chapel of the background with Wolff heirs as situated, like Golgotha, too, somewhat more elevated, but generally shapes it more dominantly, and complements it with the likewise shaped second building with i. a. a cross and adjoining own wall. Within the cartouche above Christ with cross. Beneath it, unintelligible also in its distance to the chapel, a cross amidst an only shadowy suggestion of foliage, inasmuch as imagination is not inclined to see herein a ghostly procession of the dead with the cross at the head. Modified and richer the purgatory figuration. Of rich pithiness and detail finally the building complexes within the medallions. The more elegantly presented casket on the right now flanked by four chandeliers at the expense of the two torches. The former missing with Wolff heirs, yet already present, and indeed in addition to the torches, with the monogramist’s replica, whose casket is still unchangedly chestlike. Contrary to the arrangement of the cartouches of Wolff & replica corresponding with each other in this respect, with present Ridinger copy they are placed analogously to the one in Munich directly against the border. However, the Pollefeys copy (1st state) still has torches and chandeliers, the casket chestlike, the arrangement of the cartouches à la Wolff heirs & monogramist replica, and indeed modified wigs, yet still no natural hair. The Rule of Death. The right holding a high tombstone, pointing with an arrow marked as “Presens” in the left at the inscription’s said final words OMNIA MIHI SUBDITA. With additional outline , see below , after his father’s design. Inscribed: Ioh. Iac. Ridinger sculps. / Ioh. El. Ridinger delin. et exc. Aug. Vind., otherwise as above and below. 21⅞ × 16⅝ in (55.7 × 42.2 cm). Stillfried (3rd appendix to Thienemann, 1876) & Schwarz (Gutmann Collection, 1910) 1427 (without reference to outline engraving), here though as state II (of II) as unbeknownst to either; Reich auf Biehla 296 ( “Extremely rare”, 1894 ! Without reference to state/version); Wend, Ergänzungen zu den Œuvreverzeichnissen der Druckgrafik, I/1 (1975), 290 with knowledge of Stillfried/Schwarz; Georg Hamminger 1886 (erroneously as St. 1527; “Mounted. Of greatest rarity”, 1895 ! Ditto without knowledge of state/version); Faber-Castell 146 (without recognition as differing second state, otherwise together with Schwarz 1477); Niemeyer, (The Vanitas Symbolism with Johann Elias Ridinger) in Wunderlich (ed. ), L’Art Macabre 2, 2001, illustration p. 105 (copy of the National Print Room Munich). from the plate shortened at top with at the same time modified signature, both according to the copy of the National Print Room Munich, too. The reduction concerns 1.5 cm imageless filling of the plate above the arch. Within the signature the original “Iacob” & “excud.” are each abbreviated at “c”. If the deviations in writing and punctuation of the stone inscription, see below, quoted by Schwarz only partially are real or due to an incorrectness of Stillfried must largely be left aside. The comma in the 1st line after “curo” noted by both Stillfried and Schwarz missing in the copy here. Schwarz’ presumption that the differences of his variant 1477 unbeknownst to Stillfried were merely due to the reworking of the plate is incorrect. It is a repeated version from its own plate with, however, a decisive re-attachment of weight in the inscription’s message. 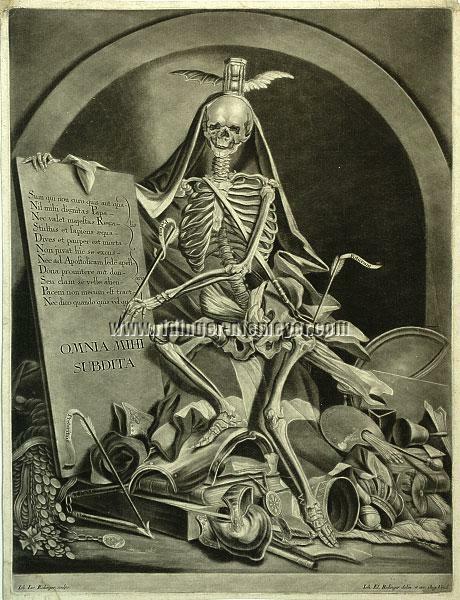 of great compositional abundance, based upon own design, and by inclusion of the painter’s tools with the attributes of transitoriness going beyond the drawing “Self-portrait with Death” of 1727 in the Berlin Print Room (color illustrations in L’Art Macabre 2, s. a., p. 94 & Ridinger Catalog Darmstadt, 1999, p. 54, as well as, b/w, per I.5, p. 61). All in the radiating light of the one from whose head bat wings will lead away the run out hour-glass, the “Presens” arrow determines the direction and the “Preteritum” arrow points at the ground. But in the quiver there is the arrow “Futurum”, however this will ever appear. And its banner flies, contrarily to both the two others, in jolly assuredness. “ Sum qui non curo quis aut qua- / Nil mihi dignitas Papa- / Nec valet majestas Rega- / Stultus et sapiens æqua- / Dives et pauper est morta- / Non juvat hic se excus- / Nec ad Apostolicam sede(m) apell- / Dona promitere aut don- / Seu clam se velle alien- / Pacem non mecum est tract- / Nec dico quando quis vel qu- // OMNIA MIHI / SUBDITA ”. The Present arrow run from the skeleton’s left pointed between the words OMNIA & MIHI. In the repetition Schwarz 1477 Ridinger has specified this message even more condensed as now the head of the arrow unmistakably points at the M of MIHI. The heavy stone slab itself typical for Ridinger as such one occurs repeatedly in his work up to the programmatic personal bookplate (Schwarz 1569) with his painter’s utensils where a boy armed with the maulstick holds it, manifesting the master’s absolute necessity of life: “Nulla dies sine linea” – No day without brush stroke. In the transitory junk of the sheet here the painter’s tools by the way once more a unison with Hogarth who closed his graphic work with the sheet of the Dying Time (“Tail Piece, or The Bathos”) of April 1764, thus six months before his death, on which, however, the palette additionally is demonstratively broken. and the watermarks WANGEN and separate IV standing for contemporary impressions and surrounding margins of 4-8 mm. Both the two upper corners of it with backed tiny injury due to previous removal of old corner mounting on blue paper. On the left side besides backed minimal marginal tear outside of the platemark. In he lower left corner faint tidemark visible only in the white margin and the signature field. In the subject itself apart from that a small thin paper spot perceptible against the light only and a pinhead-small abrasion in the background of the vault. by its 2nd state described here for the first time . The precious mezzotint technique generally, however, marked in Faber-Castell’s written inventory present here by exclamation mark & underline as “Schabk!” (Mezzotint!). (Rolf Biedermann, [Master Drawings of German Baroque], 1987, p. 338). you could wait and see with present sheet . And from whom this mastership is supposed to be ? Above the bank of Lake Walen in the canton St. Gallen and before the fall into the same. Set of 2 sheet. Mezzotints. Inscribed: J. El. Ridinger del: 1741. den 11. Martji & Joh. Elias Ridinger inv: del. et excud. A. V. 1741 resp., otherwise as below. 14 × 10⅞ in (35.4 × 27.5-27.6 cm). Thienemann 1145 ( “A very beautiful and rare sheet”, 1856) & 1146; Schwarz 1145-1146; Weigel XXVIII, Ridinger 75 a/b; Silesian Ridinger collection at Boerner XXXIX, 1984 (only sheet 2 & “extremely rare”, 1885! ); Reich auf Biehla 220/21 ( “Very rare”, 1894); Helbing XXXIV, 1500 ( sheet 2 only, the aforementioned of 1885? & “Very rare sheet”, 1900 ); Schwerdt III, 148 (“A fine set”, 1928); Counts Faber-Castell 76 (one trimmed to the edge of the subject; 1958). Neither in Coppenrath (1889/90) , Gg. Hamminger (1895) , Schoeller (1921) collections nor in listing Rosenthal (1940) and the Ridinger exhibition catalogs 1967 & 1997 ff. For Th. 1145 see moreover the drawing thematically belonging to, but not transferred into copper by Ridinger, added there (only in the 1856 original Th.) as engraving XII worked by Joh. Carl Loedel and annotated by Th. (p. XXXI) with the words “Here the stag is still fleeting, there (on 1146) he tumbles down”. And Th. 1146 corresponds with one of the most exciting among the eminent rare Ridinger paintings, namely the Petersburg one of the no. 284 (with ills.) in vol. XIV (1987) of The Hermitage Catalogue of Western European Painting, its 4 ft 10¼ × 2 ft 9½ in (148 × 85 cm), however, urged to realize a still richer composition. in very fine and with 17⅞-18⅜ × 12⅜-13¼ in (45.5-46.8 × 31.5-33.5 cm) sheet size (Schwerdt copy: 17¾-18⅛ × 14 in [45-46 × 35.4-35.5]) enviably wide-margined impressions as both frequently already technically that far out of reach for the collector of the delicate velvety old mezzotints as – … see at the beginning. Plate 1 with faint tidemark in the left white lateral margin. Plate 2 first with original fine diagonal box pleat from upper right till center, then later squeezes noticeable on the back which appear also on the front in the lower text field left and in the center, but neither the former nor the latter more considerably impairing the very fine picture impression. Light trace of dirt moreover in the right white lateral margin and on the back above. 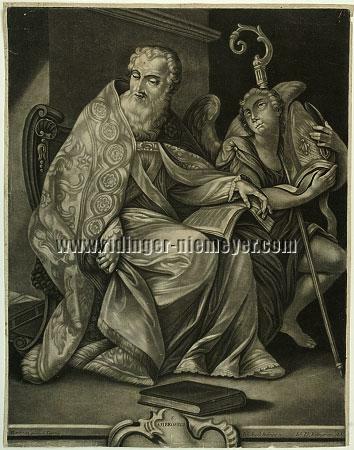 Further Ridinger mezzotints , may they be but supposedly by Johann Jacob , or likewise by the father as above , or inscribed indifferently with just Ridinger excudit , available .